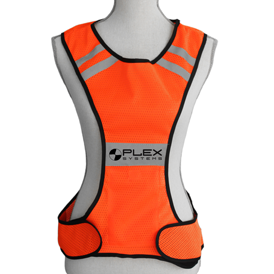 When you want to be seen this lightweight polyester knit safety vest is perfect for running, walking, or doing anything outside daytime or nighttime. Bright yellowish green or orange colors and the 3-M reflective strips make you visible to all. So lightweight you wonâ€™t know you have it on. Velcro closure inside pocket holds necessities. Adjustable Velcro waist tabs ensures one size fit all. Your artwork is imprinted in one location in gray reflective material on front and/or back. Imprint area of 1.5" x 1.5". Larger imprint of 2.5" x 2.5" adds .90 (C). Largest 4.7" x 4.7" adds 1.80 (C). Choice of bright yellow or bright orange fabric. Shipping weight is approximately 12 lbs er 100 pieces.